By Lisa P. Kirby, Esq. and Shayna K. Cavanaugh, Esq. Lisa P. Kirby, Esq. and Shayna K. Cavanaugh, Esq. 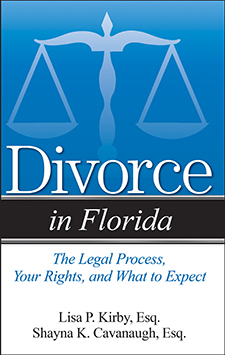 Are You Getting a Divorce in Florida? Attorneys Lisa P. Kirby and Shayna K. Cavanaugh are experienced family law attorneys and understand your needs. During their years of practicing family law, they have helped hundreds of individuals navigate the maze of divorce. In Divorce in Florida they answer not only the questions on your mind but also those you may not have thought to ask. What determines who gets custody of the children? How much will my divorce cost? Will my spouse have to pay some or all of my attorney fees? Answers to More Than 350 Legal Questions!